This vacation will last 7 days. The day will be divided into two parts. The first part will be dedicated to painting from 9: 00 - 13: 00 which will be followed by a light lunch at Villa Maria. The second will be dedicated to the culinary arts and will begin at 3:30 pm. Dinner will be consumed during the lesson. The participants will stay at the elegant hotels Villa Maria and Hotel Giordano. Each lesson will begin with a short lecture, by the teacher Ezio Falcone, on the historical elements of the daily menu. The students will proceed to the organic garden of Villa Maria to gather the seasonal products necessary for the daily meal. We will move to the kitchen of Villa Maria for the practical lesson which will explain the preparation of the appetizer, first course, main course and dessert. The last day will be dedicated to the preparation of the famous Neapolitan pizza. We will begin with the special preparation of the dough and every participant will prepare his or her own favourite pizza according to individual taste. At the end of the evening, the best, tastiest and best designed pizza will be given a prize. The same day, we will prepare the famous limoncello liqueur, produced with the unique Amalfi infusion from the special sweet lemons of the Amalfi Coast. This "Nonna Orsola" recipe is from an ancient tradition passed down through the generations. We will paint in the most beautiful gardens and villas of Ravello and visit the oldest and most historic handmade paper factory in Europe, situated in Tramonti, not normally open to the public. We will also tour and paint the ancient Roman villa Cimbrone and the medieval villa Rufolo. William Papaleo has been teaching painting in Italy and America for over 20 years. 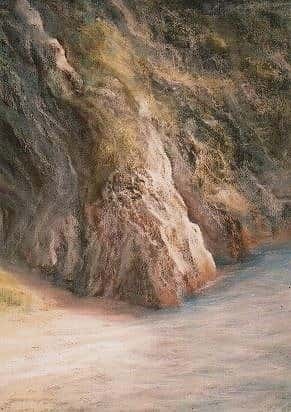 (See link www.williampapaleo.it) He studied with Henry Henche at the Cape School of Art, the oldest and most famous outdoor painting school in America. William Merrit Chase began teaching there bringing over the lessons he had learned from his time with Claude Monet. Subsequently, most of the best figurative and impressionist painters in America have studied there. Papaleo has since developed the impressionist lessons of the Cape School in a modern context to help both beginner and advanced students expand their visual perception of light and colour and to improve their general painting technique and sensitivity. Recently, Papaleo has been conducting a series of international painting workshops in collaboration with several European universities teaching modern and ancient painting technique. He is also available for portrait and figure drawing lessons available at the Villa Maria. 9:00 am - 1:00 pm: Painting in one of the most beautiful villas of Ravello with views of the seas and the mountains. Concentration on contours, explanation of aerial versus linear perspective. Seeing the Big Masses that make a painting powerful and beautiful. 3:30 pm: Daily visit to the Organic Garden of Villa Maria to gather the ingredients for the dinner of the day. The menu will be prepared and consumed each day by the participants of the course. the medieval villa constructed in the 11th Century. When it was originally owned by a pirate, it had 400 rooms. Wagner was inspired to write some of his most famous operas there. Students will choose different places to paint according to their individual needs and tastes and develop compositions based on the lessons from the previous session. 3:30 pm. This culinary lesson will concentrate on the Mise en Place, the classic from the Art de là table, the precise way to set and prepare the table according to the rules of Galateo regarding the correct use and placement of silverware and table settings. 9:00 -1:00: Painting course in a famous Ravello Villa, constructed in Liberty style, with one of the most spectacular views of the Amalfi coast. Students will develop their paintings with special attention to the light and colour key of nature. Ore 3:30 pm : Culinary arts lesson. This section will be dedicated to the meeting with the Masters of the art of fresh cheese making. There will be a demonstration of the art of Mozzarella making where students will participate. 3:30 pm: Departure in Minivan for the oldest and most historic, hand-made paper factory in Europe, situated in Tramonti. Participants will learn about the traditional, medieval technique of paper making. We will continue to Amalfi for a painting lesson dealing with works on paper. In the evening we will have dinner by the sea in one of the traditional restaurants, characteristic of Amalfi. Participants have the possibilities to join organized tours to Pompei, Capri, Paestum or Vietri, famous for ceramics. We recommend the Vietri tour as students will have the possibility to work in ceramics at a famous ceramic factory, both creating forms on the wheel and decorating objects. The tour will continues in the late afternoon with a visit to Oplonti, near Pompei. Villa Oplonti was the residence of Nero and Poppea. It is one of the greatest and best preserved examples of Roman art that has survived, both for its structural integrity and the vividness of its fresco colours, rarely found in examples of such antiquity. There are numerous structural elements such as terraces, arcades and residential rooms many with excellently preserved frescoes of diverse subjects such as magnificent peacocks, theatrical masks and still life. 9:00 am - 13:00 pm: Last day of the painting workshop. We will paint one last magnificent panorama or students may develop their favourite painting from sketches and monotype rubbings as developed by Degas with his pastels. We will have a final critique and short lecture before our final, farewell toast. Neopolitan Pizza, from the making of the dough to the final chice of ingedients. Each student will prepare , spread and decorate his or her own pizza, according tohis or her own taste. A prize will be given for the best, tastiest and best decorated pizza. There will also be time to make the famous limoncello according to an ancient recipe with the special lemons from ther Amalfi coast ,famous throughout the world . At the end of the evening there will be a Farewell toast and the consignment of Diplomas for participation in the course. Free morning and Departure for the various destinations. The daily culinary arts lessons will be preceded by a 30 minute introduction about the culinary and dietary history of the Amalfi coast and the Campania region. The practical lesson will follow and last about to and a half hours. It will discuss ingredients and cooking techniques of the daily menu. The Painting course will have the vast resources of the area to develop the lessons in light and colour not taught in schools and academies. Ravello offers architectural riches of rare elegance that have been immortalized by artists from all over the world and for many centuries. The Cathedral was constructed in the 11century and is rich with artistic treasures. 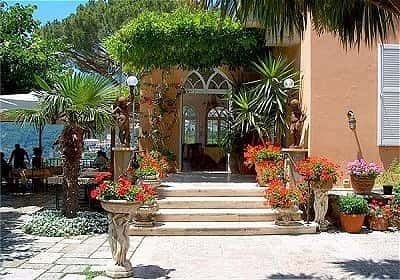 Villa Rufolo, also built in the 11 century, is immersed in a vast park of exotic and mediteranean flowers and plants . Villa Cimbrone, of humble, rustic origins , has been transformed into a villa of great beauty and fascination. Villa Maria , oasis of tranquillity with a splendid view of the sea, was the residence of a Roman nobleman and has maintained its fascination through history. Villa Eva, ancient, noble residence in the historical center of Ravello is surrounded by a park which has one the most breathtaking views of the Amalfi coast. The Rondinaia Villa is known for its spectacular position and panorama and for its uninterrupted series of famous guests . It is one of the most beautiful and original villas, not only of the Amalfi coast , but of all of Italy. It was constructed in 1904 when Sir Ernest William Beckett and Lord Grimthorpe commisioned Nicolo Mansi for the Rondinaio and the development of Villa Cimbrone. Gore Vidal visited it the first time with Tennessee Williams in 1948. Vidal returned often until he decided to buy it in 1972. It became a cultural point of reference for intellectual circles. Vidal lived and wrote there for 33 years. A large part of his literary production was accomplished there. It is nested in between the mountain rocks and a park of incalculable beauty, thus the name la Rondinaio, which means the swallows nest. This will be one of the spectacular locations for the painting course. 4) Transfers "Ravello-Tramonti", "Tramonti-Amalfi" and "Amalfi-Ravello"
- If the minimum number of students (6) has not been reached, the course will be cancelled and reservation money returned.